The certifications were delivered by the international certification bodyIntertek at a WorldFish-hosted event on 17 August 2017 attended by the Deputy Minister of Agriculture for Livestock, Fish and Poultry, Dr. Mona Mehrez. The certifications were issued under the IDH Sustainable Trade Initiative -funded Improving standards in Egypt’s farmed fish (tilapia) value chain project (2015–2017), which works to enhance the performance and sustainability of the Egyptian aquaculture sector. Led by WorldFish, the project is part of the CGIAR Research Program on Fish. 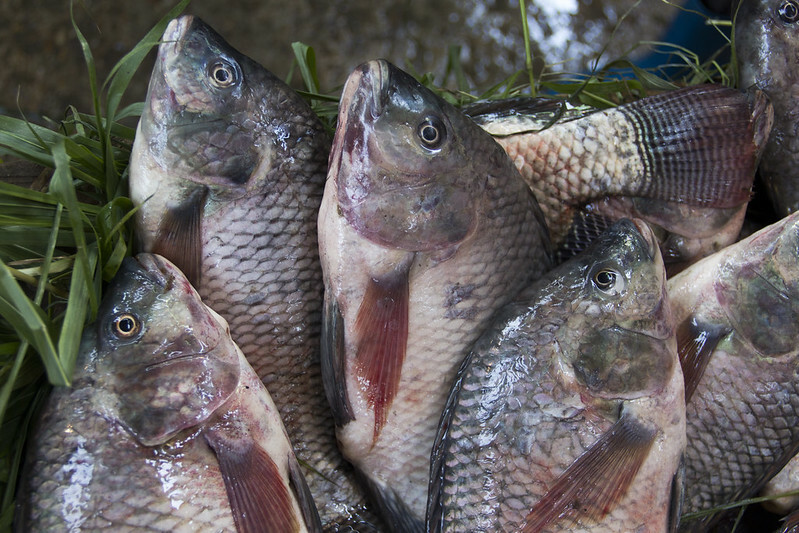 In Egypt, domestic aquaculture provides around 60 percent of Egypt’s total fish consumption, and tilapia comprises 75 percent of all aquaculture production. Yet, explains WorldFish Scientist Dr. Diaa Kenawy, many tilapia farmers have low yields and low profits, and poor supply chain practices affect the quality of farmed fish available for consumers. The certification scheme is the first of its kind in Egypt, says Lisa van Wageningen, an aquaculture program officer with the IDH Sustainable Trade Initiative. “This makes it a milestone achievement for Egypt, which is the third-largest tilapia producing country in the world. “Continued scaling up of this certification initiative and connecting farmers to European markets, will eventually help farmers grow out of poverty and halt the environmental impact of the Egyptian aquaculture sector,” she said. The quality certifications indicate that fish farmers use best practice methods to produce tilapia in an efficient and sustainable way. Specifically, this involves having good site management, good working conditions for laborers, registering data about the ponds and using good feed methods. Verification that farmers met the quality standards was done by Intertek, following regular on-site inspections of each farm. WorldFish research in Egypt shows that these best practice methods make a farm more efficient, which leads to lower on-farm costs, reduced fish mortality and higher profitability. “Registering data allowed me to replicate the same good practices, which enabled me to get a better harvest, reduce my fish losses and enhance my profitability,” he said. The certifications will enable the 50 farmers, who together produce 10,000 metric tons of fish per year, to sell their fish to new markets. This includes hotels, restaurants and hypermarkets, who seek high-quality fish and are willing to pay more for a quality product. Also, when the products reach local markets in the future, the certification label will assure consumers of the product’s quality. The best practice methods underpinning the certification process were based on a broader set of best management practices (BMP) developed through the SDC -funded IEIDEAS project (2011–2015) led by WorldFish in collaboration with the Agricultural Research Center and CARE International . As part of this project, around 2400 fish farmers received BMP training and 900 retailers were trained in improved processes for chilling, cleaning, icing and packaging in insulated containers. Now, these efforts are being continued under the STREAMS project (2015–2018), which is led by WorldFish and implemented by CARE International Egypt and the Ministry of Agriculture and Land Reclamation. The best management practices developed by WorldFish are a base for stakeholders, donors and the ministry, who have already expressed interest in building on WorldFish quality standards, to transform the awarded certificates into a commercial trademark marketable among potential buyers. The future trademark will enable farmers to secure long-term contracts with buyers including hotels, restaurants and big supermarket chains at higher prices. This will be critical to enabling the production of inexpensive, nutritious and safe fish for all Egyptians from sustainable aquaculture systems.